The drawn out Dinobot section in the campaign. High Moon Studio’s retelling of the Transformers’ escape from their dying planet Cybertron was left unfinished in 2010’s Transformers: War for Cybertron. In its sequel, Transformers: Fall of Cybertron, continues the story of the Autobot/Decepticon civil war, reintroduces familiar characters from the cartoon series, and delivers the action-packed gameplay of the original – with a few changes. Fall of Cybertron takes place directly after the events of the previous game, with Optimus and the Autobots preparing their deep-space ship, known as the Ark, for evacuation from the mechanical planet. The campaign is structured differently from the previous title. Instead of two separate campaigns – Autobot and Decepticon – as seen in the prior game, Fall of Cybertron takes you through a single storyline that alternates between the two sides. For instance, in one mission, you’ll play as Optimus Prime as he attempts to secure Energon resources for the Ark’s evacuation. In the next, you’ll take control of the Decepticon, Vortex, as he sabotages the Autobot transport carrying that same Energon supply. You’ll see both sides of the conflict firsthand, which is great for those who enjoyed the dual perspective of the first game. But that’s not all that’s changed. Fall of Cybertron forgoes the three-player co-op from the previous title, which in turn, negates the ability to choose the character you play in each level. You no longer have two companion characters following you around. Instead, characters like Jazz will move about the background, guide you through levels, and keep up the banter as you stealthily infiltrate a Decepticon base as the mission’s designated Autobot, Cliffjumper. Each level is crafted with the transformer’s abilities in mind. In some missions, you’ll play as Optimus with a heavy emphasis on shooting or you’ll do some platforming as the acrobatic Jazz, while others let you take to the skies as Starscream in amazing aerial/ground hybrid levels. Each level type is fun in its own right. The shooting sections are solid, stealth missions go without a hitch, and aerial assaults are a blast. However, the melee-focused Dinobot section of the campaign is far from enjoyable. Rather than running into battle guns blazing, firing off missile launchers, and transforming at a moment’s notice to rain-down a bombardment of explosives on enemy lines, you’re forced to continuously mash the melee button and watch the same combo animation over and over, as you wail on Insecticons. The entire section was completely out of place and drags on for far too long. Even the instant ability to transform is taken away in exchange for a rage meter that (once filled) allows you to activate your T-Rex form. Overall, the gameplay feels tighter and more focused. However, the inability to play as or interact with a larger roster of characters is disappointing. You’ll see plenty of familiar characters, like Ironhide and Shockwave, but you won’t be able to interact with most of them in more than a short dialogue exchange. It is also a missed opportunity that the more prominent characters don’t play boss roles to fill the overall lack of boss battles. Instead, you’re stuck fighting generic, larger-than-usual transformers as they show up as “sort-of” mini-bosses to replace the massive boss encounters of the first game. Throughout our playthrough, we noticed a significant amount of graphics pop-in and muddy textures. Walls appear blurry for a second or two after loading, and sometimes take several seconds for character textures to appear when fiddling with the armor options on the multiplayer menus. This lessens when we installed the game on Xbox 360, so be prepared to lose eight gigs of hard drive space. After you finish the campaign, the multiplayer and Escalation modes provide a great reason to come back to Fall of Cybertron. Not much has changed from War for Cybertron’s multiplayer, but engaging giant robots in a gun battle is just as fun as before. Successful kills and captured objectives earn experience points to unlock more weapons and upgrades, and you can customize youre Autobot and Decepticons with armor parts to make them stand out from the crowd. Escalation – the Transformers version of Horde mode – is especially addicting. Players face wave after wave of hostile transformers. You’ll choose from four character classes, each with unique support abilities including a projectile absorbing Flak Shield, Heal Beam, automated Battle Sentry, or the ammo replenishing Ultra-Power Core. When you get a kill in Escalation, you earn money, which you can use to purchase weapons, activate traps, and open doors to access new sections of the map. The enemies come out in droves, so sticking with your team and devising and effective battle strategy is the only way to survive. Transformers: Fall of Cybertron is a solid action experience with a few issues that hold it back from greatness. The story campaign entertains and the multiplayer modes entice you to come back after the credits roll, but the out-of-place melee segments, polish issues, and dropped features from the first game make it fall short. 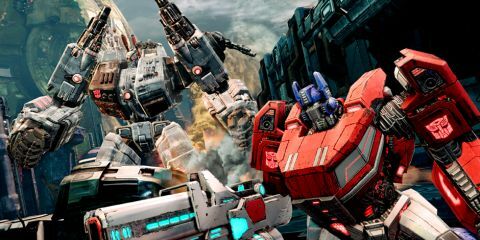 If you’re a Transformers superfan looking for more giant robot action or just looking for a fun shooter experience, Transformers: Fall of Cybertron will not disappoint. Description The Autobots and Decepticons battle it out on their dying home world of Cybertron. Featuring the return of fan favorites the Dinobots, including Grimlock (him king).